There are 3 types of control schemes for VFDs, V/Hz, Vector and Flux. Most major VFD vendors like Danfoss, Gozuk, ABB, Rockwell Automation, all have each technology. 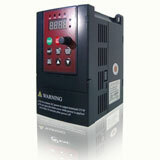 V/Hz is the oldest, most basic control scheme but is still used by all VFD vendors for multiple motor applications. Vector technology offers enhanced control and the ability to control a motor closer to 0 speed (V/Hz is limited to ~ 5 Hz as a minimum usually). Flux control is the highest level and can match DC performance such as full torque at 0 speed. 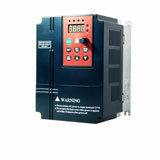 Many variable frequency drive companies have flux capability like Danfoss and ABB. ABB's version of flux control is DTC. Flux control is seldom needed by the load perhaps 5% of applications require this level of performance. ABB's DTC can hit this higher level of performance as can Danfoss with its type of flux control. Vendors vary as to the use of flux control. Most vendors tend to only use the more complex flux control when the load requires this level of control. Other vendors, like ABB's DTC, tend to offer this level of control as standard on many more VFDs. This application is about the tension control principle of variable frequency drive applied to the stainless steel grinding machine. Trial run shows the VFD manufactured by Gozuk can achieve as prominent performance and reliability as imported ones of its kind, but price is pretty lower.